The Add-A-Mite is a simple mechanical pocket adder (see the lower photo) is made of aluminum, iron and brass with bright blue paint. 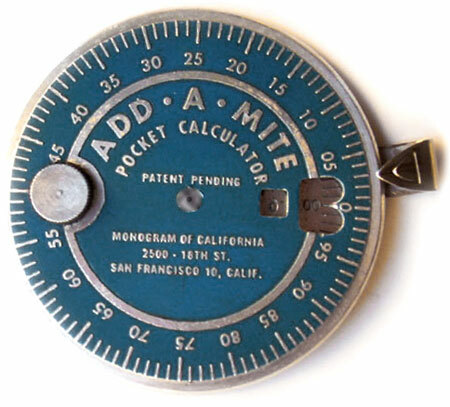 It was manufactured and sold from the beginning of 1950s by the company Monogram of California, San Francisco. The cursor on the right is depressed and dragged to the number you wish to add, 0 to 99. When released, the cursor engages a gear tooth on the back of the disc and when you then drag the cusor clockwise back to the 0 position, your number is added to the result. Crossing from 99 to 00 causes an automatic carry into the hundreds window, allowing sums up to 24,99 dolars. Subtraction works similarly by starting from zero and dragging counter clockwise to the desired number. The construction was not very successful, since the small numbers make it difficult to read, and there is no fixing mechanism, not even at zero, so the setting cent is almost analogous and thus quite prone to error.